Global warming has been one of the most trending topics in recent times, and for a good reason. The current tornado events in North America have evoked discussions as to whether there is a connection with global warming. Of course, as a gardener, you are on the side of making the world greener, better and more habitable. One of the simplest ways of contributing to a better environment is having good disposal habits. The amount of recycling education and use of compost bins has increased over the years. As a gardener, you need the best compost bin to hold all organic waste from the kitchen. You help the environment in a positive way by composting. There are various types of outdoor bins on the market. You can find some made from stainless steel and others from sturdy plastic. The choice entirely depends on you. The stainless steel bins, for example, are more long-lasting while the plastic bins make less noise. There are pros and cons to each type. 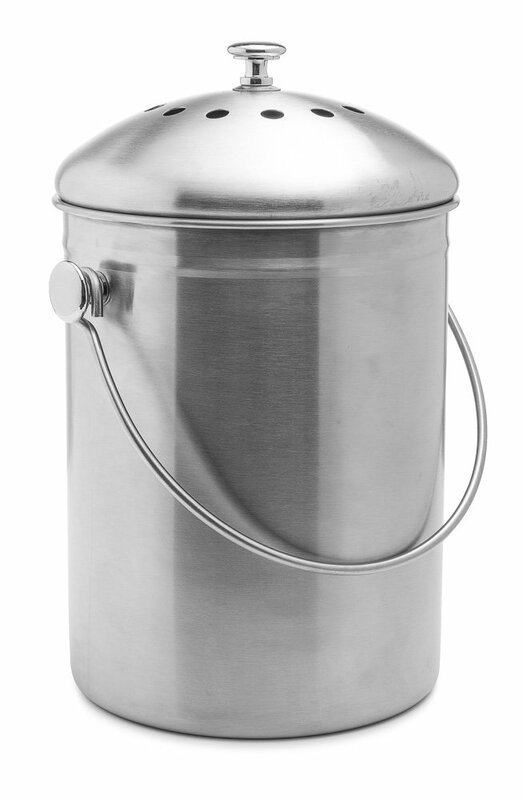 Some outdoor composters also have an ordinary lid you can toss open. Others have an airtight lid which encourages faster rotting. The airtight options are always best because they prevent pets and other rodents rummaging through the mess and leaving everything untidy, smelly and unhygienic. Some bins also have various access points that make it easier to deposit, as well as, harvest your compost for your garden. This is for those that find it hard to make the to and fro journey to the garden. The indoor bins are the convenient and the attractive types that make everything easy for you when doing your cooking and other stuff. The indoor bins carry innovative designs with filters, trap door, and charcoal lid to keep your compost from smelling. They are mostly high durability or stainless steel for easy cleaning. You don’t want an eyesore in your kitchen, do you? Kitchen compost bins also have inbuilt mixers to keep the materials moving and the breakdown process easy. Tumblers are as the name suggests – they are round in shape. You can roll tumblers to mix the contents eliminating the need to use a shovel. Tumblers also have blades and holes on their sides to aid in breaking down the compost and aeration process. For those willing to make an extra investment, there are tumblers on the market with chambers to separate the contents according to the level of decomposition. Before you can purchase a bin, think about where it will be located. If you are hauling the waste in a wheelbarrow, then you will need adequate space beside the bin. The design must make it possible to use the wheelbarrow. Outdoor bins must be frost and UV resistant since they will be outside the house most of the time. There are plastics hard enough to withstand extreme changes in weather, and there are others that are just poor quality. Having a pale looking bin in your garden is a real put off. Design and color are other factors that should also be considered depending on whether it will be an indoor or outdoor bin. You won’t want to select one that clashes with the interior décor of your home. Also, consider choosing a compact design to quickly hide the container under the sink away from the prying eyes of your visiting in-laws. If your area is a favorite for particular kind of pests and animals, then you should consider going for well-sealed bins. Composts are great places for rats and mice to build nests. If your area has an overflowing population of the same, chose tightly-sealed bins. They should also be above the ground. Basic models should typically come with a charcoal filter. Charcoal tends to filter out bad smells from your compost so that you are left with what is essential. In typical cases, the compost should be changed every six months. Some models can make compost tea and when diluted with water, is an excellent natural fertilizer. As a gardener, I find this feature quite useful as it ensures you have a continuous supply of organic fertilizer. If you need your compost quicker, you can go for those models with ridges and holes on their sides for better mixing and aeration. Certain compost tumblers have this feature which is great especially for those gardeners that are just finding their niche. Size and access are other critical features that as a gardener you should consider. Getting too small a size will make shoveling out the contents a hard task. If a compost bin has side or bottom door for taking the good stuff out, the better. This is one of the most aesthetically appealing composts on the market and having it in your garden will make anyone fall in love with it. The ability to create both solid and liquid compost is appealing to anyone having a vegetable or flower garden. It has a compost tea collecting base that you can easily access and use in your garden. Any compost bin you put in your garden should be durable and weatherproof. This product fulfills both requirements and goes further by having antioxidant protected and rust-free material. This means that you may be having this tumbler bin around for a very long time and that cannot be a bad thing. You may be among those searching for a compost bin with a large volume saving you the trouble of having to empty it every now and then. The good thing about this Worm Composting Bin is that it has an attractive large volume – expandable to 8 trays. It is easy to use and comes with an instructional manual should you feel you need a point of reference. In addition to the manual, there is an infographic that helps which foods are best for the worms in your composting bin – how fun is that? This compost bin is for those that think going all the way to the compost is an uphill task. It is convenient, and all you need to do is toss it underneath the sink after putting all the food remains and peelings there. It is also an attractive bin you will be proud of showing off to friends when they come over for some catching up. All the un-pleasantries that go into the bin require something easy to clean. This bin can clean up well leaving a shiny surface which you can almost use as a mirror. It is durable and most of all, compact. It is evident and okay as a beginner to look for cheaper alternatives. 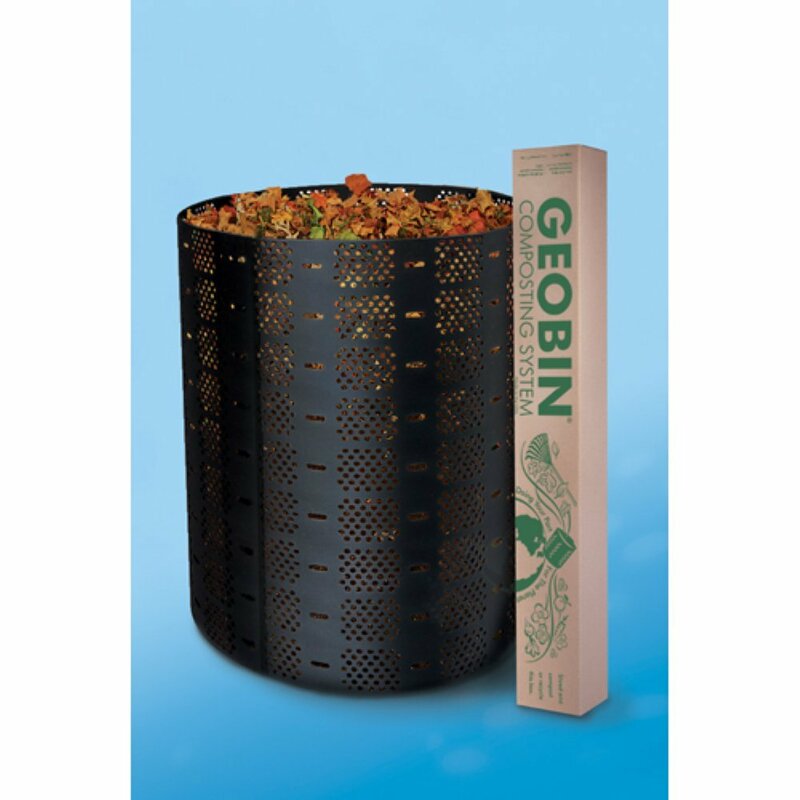 This composter by GEOBIN is pretty kind to your pocket. And to demonstrate the organization’s commitment to the environment, it is made from 100% recycled plastic. Should you need to take it elsewhere, this bin is light and easy to move. Composters should be adequately aerated. The first thing you notice about this item is the mesh-like look and its general simplicity. It is straightforward to handle, and you only need to place it at a convenient place. However, this composter is not the best for outdoor use as it may attract all kinds of rodents and animals. Does not have a lid and so may attract raccoons and other rodents. Some of us may not like the idea of moving from the kitchen to the yard taking leftovers and peelings. This compost bin from Cooler Kitchen may be the best for you if you want everything right there in your kitchen. It has a classic modern look, and you will not have to throw it under when your in-laws come knocking. 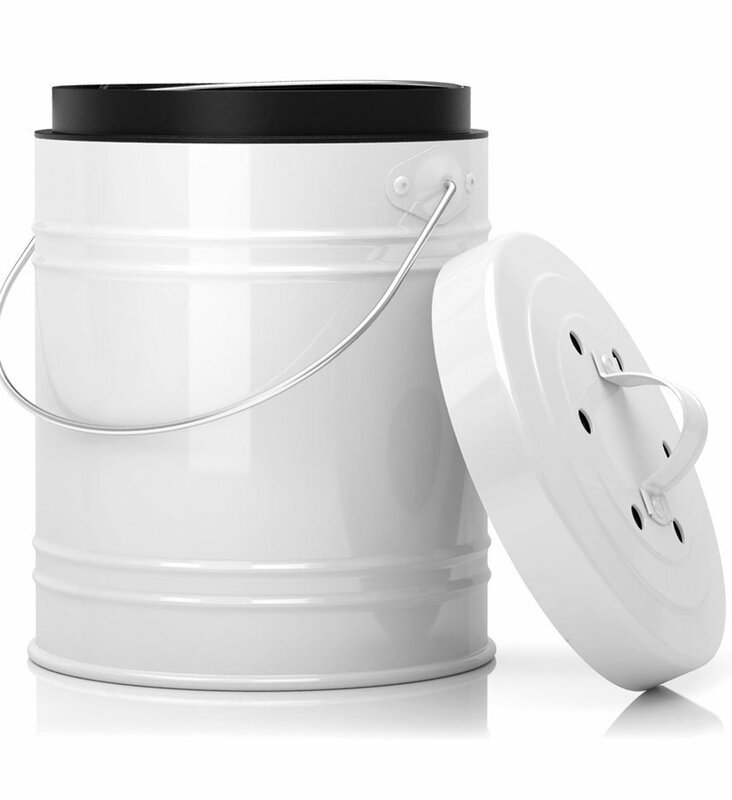 It is an innovative composter with attractive features such as odor blocking. The top lid has activated charcoal filters that keep odor and fruit flies away from your kitchen. The composter is so easy to open and also keeps the bugs and rodents away. The interior is not rustproof and may give in under high condensation. 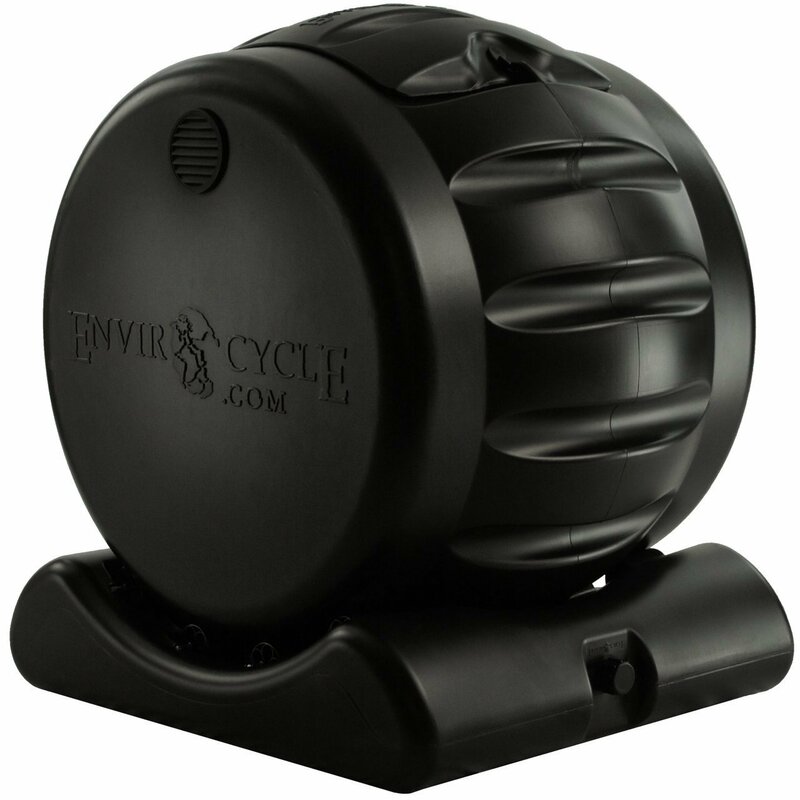 If you are the type of person that loves efficient and functional equipment, then look no further than the Envirocycle Composting Tumbler Bin and Compost Tea Maker. 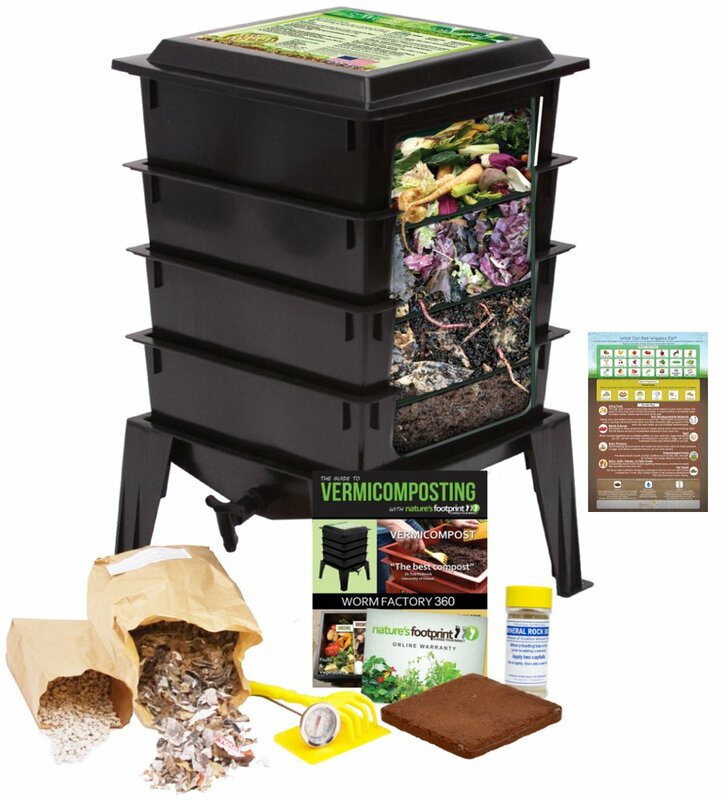 This composter breaks down your leftovers and other organic trash efficiently making both liquid and solid compost. This means that your garden is well-covered. Good compost bin reviews should be easy to use, and this product easily fulfills this requirement. The design and size are just great and will make you appreciate it significantly.